Little differences… – …STILL CRAZY AFTER ALL THESE YEARS! 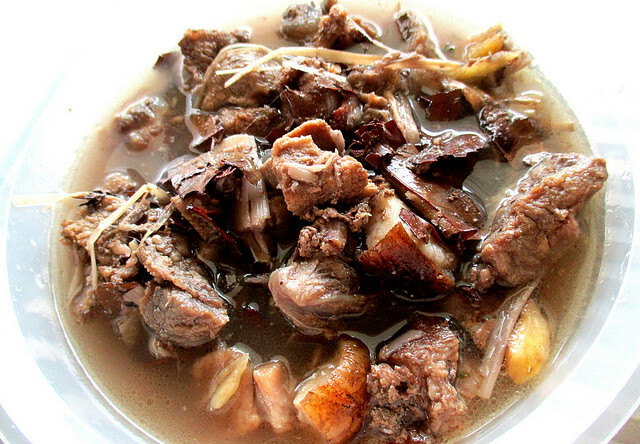 – wild boar cooked in bamboo and I do have some of the much coveted meat in my freezer. My friend’s father, retired and living in the interior somewhere, would go hunting and he did manage to get one recently and I bought some from him through the aforementioned friend. I did try cooking a bit of it the way we would do it in the family but either I added too much water or the boar was not old enough so the very lovely fragrance of the meat was not all that strong. At best, it was nice but the older ones would be very much nicer. …and cook it pansoh-style but with some little differences. 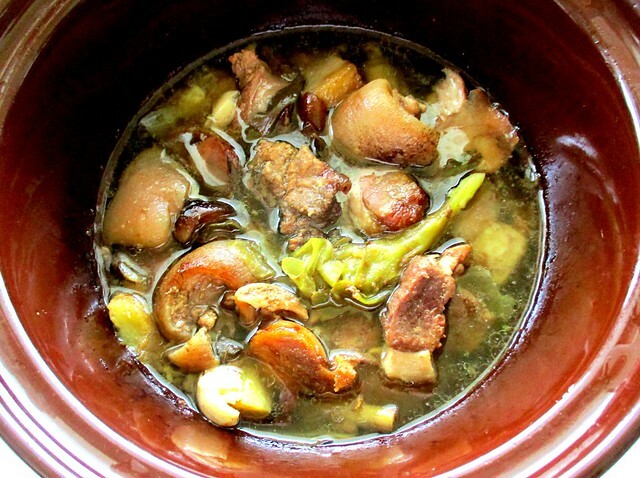 For one thing, I did not cook it in bamboo and for another, I did not have any tepus, a ginger plant – some say it is a must-have in pansoh-anything. 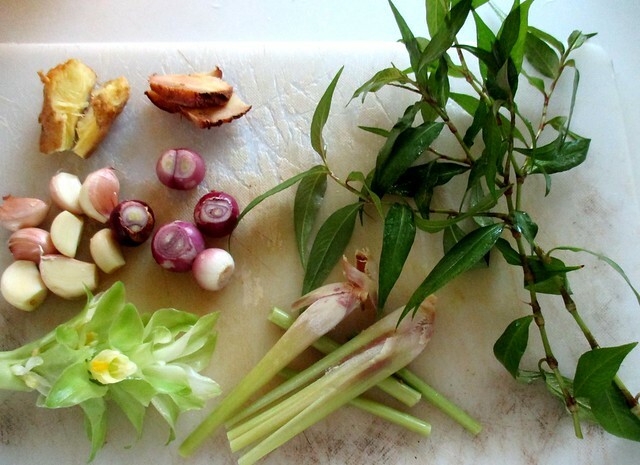 …the shallots, garlic, ginger, lengkuas (galangal), serai (lemon grass), daun kesum (Vietnamese mint) and I even threw in one of my kunyit (turmeric) flowers. 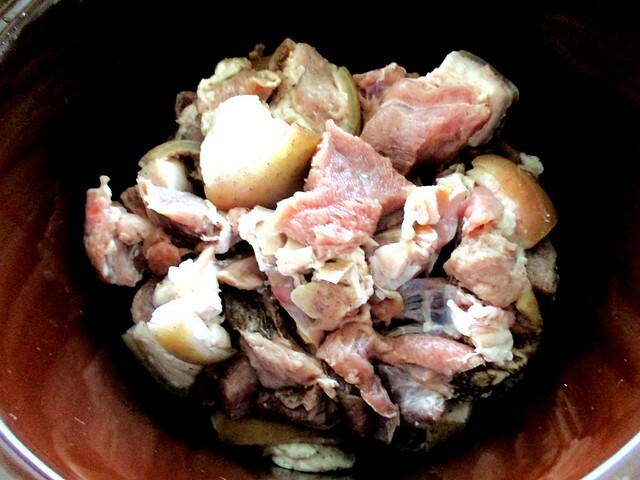 Of course, I cooked the meat in the slow cooker until all the juices and the fat/oil had come out before I mixed all the ingredients with it…and I added a bit of salt, water and some tuak (the Traditional Dayak rice wine) as well. The traditional way would be to line the bamboo tube with banana leaves and everything would be placed inside before stuffing the mouth closed with tapioca leaves and to stand it beside some hot burning charcoal to cook. …but personally, I still prefer how we would cook it all this time in the family…but this sure is a welcome change. Wow! Hunting for wild boars? Must be quite dangerous, right? I have only eaten wild boar curry which is the only way they cooked wild boar here to be sold to customers. They have been hunting it for food but they sell any excess for a bit of income. The only danger that I know of would be those stories that I’ve heard about the spirits that roam the jungle and there have even reports in the newspapers about people “accidentallY’ shooting and killing their hunting companion, touch wood! I hear the wild boar over at your side is only good for curry – the meat is different because of their diet so not so nice if cooked the way we do it. I always heard that people say wild boar meat are tough and had a weird smell. How true? I have never tasted it myself before. Good! Good! Let everybody think this way and the price will not shoot up to kingdom come! That way, it will still be more affordable. I prefer all cook for me and I just need to heat it up. Not good at cooking wild boar. Hehehe. There is a pack of frozen meat in my freezer, I still not yet cook it. Can’t go wrong whichever way you choose to cook it…if the meat is good. This way is so very easy too, just dump everything into the slow cooker. We used to have wild boar where I grew up too. You have? In the Land Down Under. Well, there’s Pumba in The Lion King too! LOL!!! traditional borneo dishes like these are so fascinating – and so difficult to find in the peninsula! Getting more and more, I gather. Even harder here unless we cook our own. So far, in Sibu, I only know of one or two. Happy Lunar to you & your family, Arthur! Thanks again, Arthur, for the wild boar meat. Thanks, June, and the same to you and yours. It is not very nice, none or very little of the wild boar meat fragrance so it is best cooked this way. Much nicer with all the added ingredients. Thank you. Hope you and your family will be blessed abundantly too in the Year of the Pig.